Fine antique furniture that has not been properly cared for in a while can show visible and ugly signs of wear and tear. Sometimes even pieces that receive regular cleaning can exhibit indications of damage due to one careless accident such as a spilled drink or a bad bump. You may feel that you need to have the piece brought in for fine furniture restoration, but often there are many things you can do yourself. It is imperative, however, to ensure that your method for cleaning and restoration will not have any unintended side effects. Some DIYers swear by oil and vinegar. Preparing a solution of the two supposedly helps to repair the old wood. However, this does not always work. It depends on the type of wood, the type of oil, or both that affects the results. Many antique restoration buffs and aficionados also claim that regular maintenance with oil will keep the wood clean, moisturized and in pristine condition. But the truth is that while oil may help preserve shine, it does not keep the wood from drying out. The wood dries due to lack of moisture, and as such should be kept away from hot, dry places. New technology and gadgets that can be purchased by DIYers make cleaning and maintenance easy and convenient. True, but it is a myth that these methods are better than older, time-tested methods of antique restoration. Instead, the vintage furniture may suffer sustained damage. For example, some new tools use UV rays to help clean the furniture, but too much exposure can damage the wood over time. If you do need to bring the piece in for more care than you are able to provide, or you need advice or assistance, make sure you contact Carrocel fine antique furniture store knowledgeable about antique restorations. 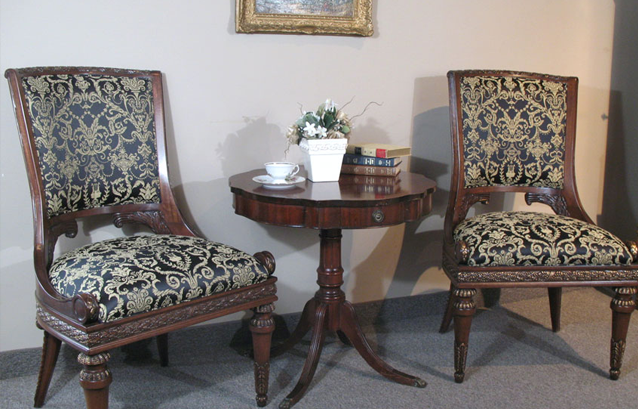 For more information about antique furniture care, contact Carrocel fine furniture store. We will be happy to handle all your antique restoration needs.